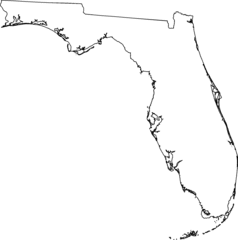 Attached below for download are drawings for the outline of Florida. While the black and white image (bitmap) of the outline can be useful, the vector drawings of the Florida Outline will allow illustrators to add layers of information to the outline and to resize without the resolution limitations that bitmaps (images) have. The original was saved in corel draw 9 with conversions to adobe illustrator and other formats. If you are enhancing the drawing in Corel Draw with additional layers and wish to contribute back, please contact us. We request that when you publish that you give the society credit and consider this material a permissive"copyleft" under the LGPL license for open source use. It is our intent that this resource be not restricted for publishing by users but also not to be restricted to future users either so while works including the drawings may be copyright, the drawings themselves are copyleft ;).